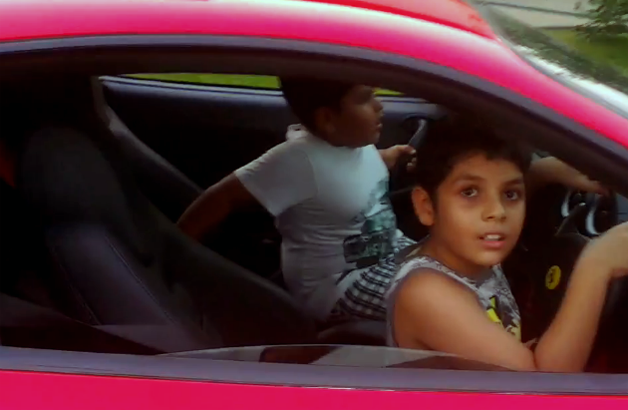 Few Days before, we brought you the Video of a 9 year old boy driving a Ferrari F430 and later driving Range Rover. As expected, the video which went viral on Youtube has now brought father of child into trouble as police has registered an inquiry into case and files case against father, Muhammed Nisham. The Peramangalam Police summoned Muhammed Nisham, the owner of the Ferrari F430 Scuderia, on Thursday to record his statement after Thrissur City Police Commissioner ordered an inquiry into the incident. A case has been registered under the Motor Vehicles Act and Section 23 of the Juvenile Justice Act. “We are going ahead with the inquiry. We are yet to take the car into custody and prepare a statement,” said P.C. Bijukumar, Circle Inspector, Peramangalam Police. He said Mr. Nisham was out of town and likely to return within a couple of days after which he would be summoned for further proceedings. Ofcourse, the child has driven the car in a careful manner and slowed down the speed before the pump and nothing looks to be a case of rash driving, however, still it could have brought other children in locality as risk. The child also handed over the keys of the car safely. Mr. Muhammed Nisham, who has several businesses in India and abroad has many other cars apart from this Chandigarh registered Ferrari F430.